With the increase in high-rise residential living, there’s one piece of the design puzzle that can often go overlooked. Urban dwellers might be reaping the benefits of apartment living in a booming property market, but if acoustics aren’t properly chosen, the resulting noise pollution can tarnish the quality of life. The acoustics of a space is something that goes beyond comfort, with dozens of academic papers identifying a link between even modest levels of sound and increased stress, irritability and loss of sleep. An amplified awareness of the impact of sound on health – in conjunction with a rise in high-density living – has compounded the importance placed on acoustic design over the past decade. A recent government survey in Victoria found respondents rated noise as the fourth most important out of fourteen issues presented by apartment living after daylight, space and natural ventilation. “People in general are becoming more aware of their acoustic environment, just listen to people complaining about restaurants and bars being too noisy to speak to the person next to them,” says Keith Hewett, associate director of consulting group TTM. “As the public become more discerning and demand more acoustic amenity, developers and designers will have to react to the demand,” Hewett explained. It’s vital to first understand the basics of sound and how it is transmitted to create an acoustic design. Noise is classified into two categories: airborne and impact noise. Airborne noise travels through the air, often through a direct or open path. Most commonly, it comes from sources such as voices, TVs and radios. On the other hand, impact noise is generated by vibrations. This type of noise often travels through the structure, thereby creating noise in nearby rooms. Examples of impact noise may include heavy footsteps and vibrations from plumbing systems. Acoustic design will achieve its maximum potential – not to mention be the most cost-effective – if it’s considered early in the concept or master-planning phase. The sooner in the design process an acoustic engineer is engaged, the higher your chances at avoiding costly retrofit solutions. Nicholas Tselios, director of engineering consulting firm Renzo Tonin, says that architects usually make decisions relating to the acoustics based on what has worked for previous projects. On the contrary, Tselios emphasises the importance of assessing each project individually for relevant risks. A successful design will consider a project’s acoustic challenges in the context of its broader environment. In a residential project, managing acoustics is often a complex process with myriad considerations. For instance, architects must take into account all potential sources of noise and their potential impact on residents. To mitigate these risks and create an acoustically pleasing environment, they must then employ a combination of good design and well-researched products. In high-density living, when noise cannot always be reduced at the source, acoustic management comes down to a well-designed building. Effective site planning will examine the sources of noise and ensure that they do not come too close to quiet spaces. Locating bedrooms as far away from noise sources as possible and placing noisy areas in a confined area are two strategies to be considered in terms of footprint design. If possible, install windows away from noise sources and select sound-absorbing types of glass. Sound can be managed using the ABC of acoustics: absorb, block and cover. Sound absorption is the ability of a material to absorb the sound energy and convert it into heat. Sound-absorbent products will disrupt the path of noise and reduce its ability to transmit through a surface. Sound blocking involves using dense, often heavy materials to prevent sound from entering or leaving a space. Instead of absorbing it, blocking products will deflect the path of sound. Hewett notes that some of the key problems faced by architects in acoustic design are noise build-up, poor speech intelligibility, and the general discomfort created by our current fascination with minimalist, sleek lines and hard surfaces in contemporary architecture. “The problem is compounded by this aesthetic not lending itself to easily integrate acoustic treatment to control reverberation and specular reflections,” Hewett said. The third method for managing sound is covering or masking. This approach adds sound to an environment to disguise the noise left behind. By covering noise, architects can reduce its impact and make it less disturbing to residents. Often, the best way to tackle noise is to use a combination of absorption, blocking, and covering products to achieve the individual acoustic needs of a project. 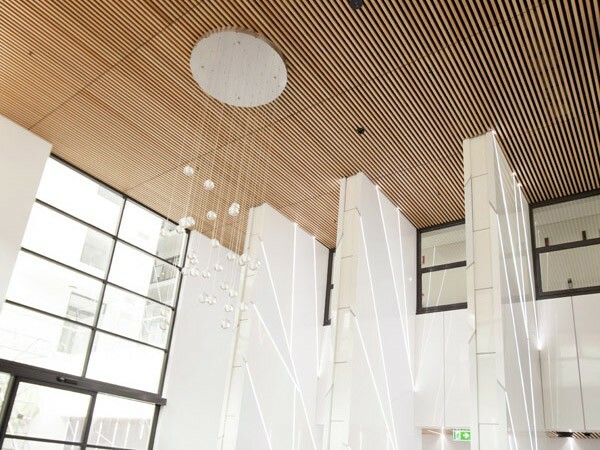 These days, architects are spoilt for choice when it comes to choosing acoustic materials. “There has been a proliferation of acoustic products over recent years, with a vast array of shapes and colours, even clear absorptive products to place in front of glazed walls and products that are disguised to blend in with the architectural aesthetic,” says Hewett. Effective acoustic design will incorporate a combination of products with different characteristics to achieve an acoustic goal. Impact noise from footfall: Floor sound impact performance is the biggest cause of complaint from occupants of apartments. Regupol is just one of many companies that provides acoustic floor underlay products. Its products work to reduce impact noise by isolating floor finishes from the main structure of the building, which in turn reduces the impact energy generated by general footfall. Another product, Unrioll Acoustic Underlay, is used by most major Australian developers, builders and installers. When acoustic underlay won’t solve the problem, additional treatments – such as battens with acoustic underlay under the floor – can be used. Yet another way to reduce impact noise is by breaking up the structure to eliminate vibrations travelling through solid surfaces. Absorbing the vibrations is most commonly achieved by specifying resilient sound isolation mounts and hangers. For optimal results, it’s recommended using resilient isolation hangers that have been acoustically tested in complete wall assemblies. Studco provides a Resilmount range of isolation mounts which are constructed using a high-quality thermoplastic polymer and have demonstrated in testing at the Riverbank Laboratories in US their ability to perform in a range of wall and ceiling assemblies. Transmission through walls: Sound transmission between tenants’ walls can be managed using high-performance insulation. Bradford Acoustigard Partition Rolls are manufactured by spinning molten glass into fine wool-like fibres and are designed for use in metal-framed internal partitions and walls. Acoustiguard can be used to achieve a Noise Reduction Coefficient (NRC) of up to 0.90. Intertenancy walls are commonly constructed with multiple layers of building materials and can incorporate CSR Bradford Acoustigard Insulation, CSR Gyprock and CSR Hebel to achieve the minimum sound transmission performance of Rw + Ctr 50. Pipe noise: Pyrotek’s Soundlag 4525C reduces pipe noise from wastewater between multiple stories often by 10-50dBA. It provides acoustic decoupling between the pipe’s noise energy and the 5 kg/m2 flexible acoustic barrier external wrap. It has been rated as 6 Stars and is suitable for use in luxury apartments. Impact noise from machine vibration: Equipment noise – from sources such as washing machines or air conditioning units, for example – is a challenge in all residential environments. Its impact on residents can be reduced using anti-vibration mounts. Embelton has a range of anti-vibration mounts including rubber and sprint mounts, waffle pads, air mounts, isolation hangers and seismic mounts which can be used to isolate unwanted machine vibration and prevent it from transferring into the structure. Managing public spaces: The advantages of good acoustic design are also felt in shared spaces such as lobbies, corridors and gyms. Screenwood offers linear timber systems that combine the aesthetics of natural timber with hidden acoustic backing. Solutions are available in a ceiling tile format, ready to lay into a standard two-way ceiling grid, or in a panel format. High-wind noise: A trend is emerging within the context of tall apartment towers, where residents are complaining of noise disturbance during high wind events. In many cases, the source of this noise is internal cold-formed steel wall structures. Studco Building Systems has developed the Studco Vortex system to address this issue. The system is a steel stud and track system that removes tension and deformation from the steel building elements to ensure complete isolation of metal-to-metal friction.